Home » Fall Favourites So Far.. I have decided, you will be thrilled to know, that the next few blogs will be dedicated to my fall favourites. It’s really the only way I can show you any current obsessions. There is no way I can put it in one blog, new shipments keep coming, as do new obsessions. A new line just came into The Room, MUS (pronounced muse) is a new luxury knitwear line started 2 years ago. Am also obsessed with sweaters and shorts. Can we please disregard dorky model? Consider the sweater instead.. And the shoes. I f—ing love this sweater. Remember I told you about the Margiella oversize flap clutch?.. Here it is. The bracelet and cuff are also new, amazing, no? You are going to see a lot of the oversize clutch this season.. Worn, also, with the forever classic black (Balmain) blazer. 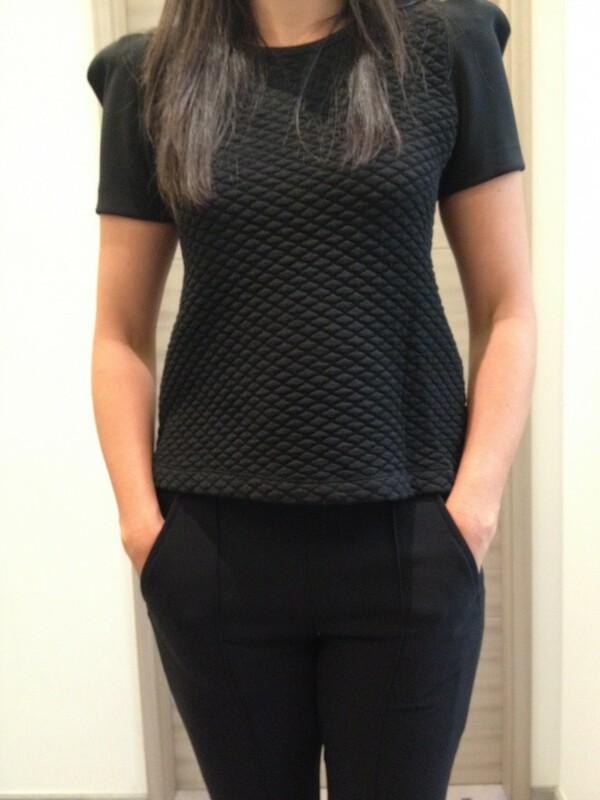 The perfect black pants just came in, Nina Ricci, everything about these pants works. And how about Carven? GAWD it’s a good line. Very French ‘it-girl’. It has been shockingly popular since it came in. Again with the clutch.. And continuing to disregard the model, can we look at the Charlotte Olympia shoes? The classic ‘Dolly’ is probably the most popular, they have sold out within days of coming in. Have I mentioned leather pants yet? Big this season. Very big. Also in love with these Pierre Hardy wedge boots. The leather pants are Vince, did I mention that Vince is now at The Bay? I feel like I could buy every piece of Vince – it’s one of those lines..
Kinda like the Beastie Boys Check Your Head record, loved every song instantly, I still do. That never happens anymore. Stand by for coats and jackets, and more shoes..